The George H. Heilmeier Faculty Award for Excellence in Research was established by Penn Engineering for the purpose of recognizing excellence in scholarly activities of the faculty. Named in honor of George H. Heilmeier, it recognizes his extraordinary research career, his leadership in technical innovation and public service, and his loyal and steadfast support of Penn Engineering. Cell invasion into the surrounding matrix from nonvascularized primary tumors is the main mechanism by which cancer cells migrate to nearby blood vessels and metastasize to eventually form secondary tumors. This process is mediated by an intricate coupling between intracellular forces and extracellular forces that depend on the stiffness of the surrounding stroma and the alignment of matrix fibers. A multiscale model is used to elucidate the two-way feedback loop between stress-dependent cell contractility and matrix fiber realignment and strain stiffening, which enables the cells to polarize and enhance their contractility to break free from the tumor and invade into the matrix. Importantly, Dr. Shenoy’s model can be used to explain how morphological and structural changes in the tumor microenvironment, such as elevated rigidity and fiber alignment prior to cell invasion, are prognostic of the malignant phenotype. The model also predicts how the alignment of matrix fibers can recruit macrophages, which are among the first responders of the innate immune system following organ injury and are crucial for repair, resolution, and re-establishing homeostasis of damaged tissue. 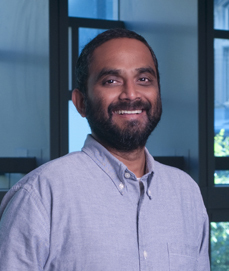 In this talk, Shenoy will discuss how the deformation of the nucleus during migration can lead to changes in the spatial organization of chromosomes and their intermingling which can result in genetic mutations and genomic instability. He will also discuss how targeting extracellular matrix mechanics, by preventing or reversing tissue stiffening or interrupting the cellular response in cancer and fibrosis, is a therapeutic approach with clinical potential. Vivek Shenoy is the Eduardo D. Glandt President’s Distinguished Professor of Materials Science and Engineering in the School of Engineering and Applied Science at the University of Pennsylvania. Dr. Shenoy’s research focuses on developing theoretical concepts and numerical methods to understand the basic principles that control the behavior of both engineering and biological systems. He has used rigorous analytical methods and multiscale modeling techniques, ranging from atomistic density functional theory to continuum methods, to gain physical insight into a myriad of problems in materials science and biomechanics. Dr. Shenoy’s honors include a National Science Foundation CAREER Award (2000), the Richard and Edna Solomon Assistant Professorship (2002-2005) and the Rosenbaum Visiting Fellowship from the Isaac Newton Institute of Mathematical Science at the University of Cambridge. He is the principal investigator and director of the NSF-funded Science and Technology Center for Engineering Mechanobiology established in 2016. He also serves the editor of the Biophysical Journal and is a fellow of the American Institute for Medical and Biological Engineering (AIMBE). 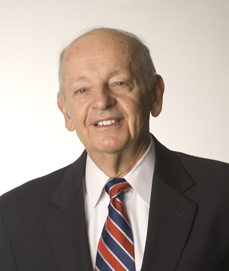 Dr. George H. Heilmeier was Chairman Emeritus of Telcordia Technologies, formerly Bellcore, a leading provider of communications software and professional services. Prior to his retirement in November 1997, he was Chairman and Chief Executive Officer. He also served as Senior Vice President and Chief Technical Officer of Texas Instruments, Inc., Director of DARPA and Head of Solid State Device Research at RCA. Dr. Heilmeier received international recognition for his discovery of several new electro-optic effects in liquid crystals leading to the development of the first liquid crystal displays for watches, calculators, and instrumentation, and he held 15 patents. Dr. Heilmeier served as a White House Fellow, and was a Life Fellow of the IEEE and the American Academy of Arts and Sciences. He was a member of the Defense Science Board, and the National Security Agency Advisory Board. He served on the Boards of Directors of TRW, the MITRE Corporation, INET Technologies Inc., Teletech Holdings, and Automatic Data Processing (ADP) Corporation. He was also a member of the National Academy of Engineering and Chairman of the General Motors Technology Advisory Board. Dr. Heilmeier’s leadership in telecommunications and technology management was also recognized through honorary doctorate degrees from Stevens Institute and the Israeli Institute of Technology (the Technion). Dr. Heilmeier passed away on April 22, 2014.